March 26 (gogo.mn) Daylight saving time will commence on Saturday (March 28th) when 2.00am becomes 3.00am. Thus, set your clock forward by one hour and will end on September 26th. Cabinet meeting approved that order on March 09. Mongolia adopted the daylight saving time in 1960 with the government resolution No245 for the first time. Later in 1985 with the resolution No74 it was ordered to switch to daylight saving time on every last Sunday of March until the last Sunday of September. This resolution was in effect until 1999 for 14 years and was dismissed with the resolution No48. Again in 2001 government resolution No93 ordered to switch to the daylight saving time and was then again dismissed in 2005. March 26 (Reuters) - Rio Tinto's chief executive will visit its $6.5 billion Oyu Tolgoi copper mine in Mongolia on Sunday, two people familiar with the visit said, amid signs the country's new prime minister is keen to end disputes that have delayed an expansion project. Sam Walsh will visit the mine, located in the Gobi desert around 80 kilometers north of the Chinese border, to meet employees, said one of the sources, who asked not to be named because issues related to the mine are sensitive. Time will also be made to greet members of the business community and some government officials, the source added. Disputes over costs and taxes have delayed an expansion of the mine that would extend its life beyond its estimated 15 years. That has stoked investor worries about "resources nationalism", with several governments across the world looking to renegotiate contracts to get a bigger say in mining projects. However, some analysts say Prime Minister Chimed Saikhanbileg is keen to reach a deal as Mongolia faces slowing growth in neighbour China and a softer market for its natural resources. "Saikhanbileg's administration is Rio's best chance for a deal on Oyu Tolgoi phase two," said Nick Cousyn, chief operating officer of Ulan Bator-based broker BDSec. "They (Rio) can either empower him by showing flexibility and respect, or risk losing Mongolia to the populist opposition." The visit will be Walsh's second to the project, although his first since becoming chief executive in 2013. Rio's Turquoise Hill Resources owns 66 percent of the mine, with the Mongolian government owning the rest. In addition to the open-cut mine currently in operation, the so-called "phase two" project would see the construction of an underground mining complex. Mongolia's talks with Rio slowed last year because of its transition to a new government, Jeffery Tygesen, chief executive of Turquoise Hill Resources said in a phone call with investors on Mar. 25. Last year, he said, Rio handed Mongolia a proposed resolution to issues including a $127 million tax claim that was later reduced to $30 million and approval of a $4 billion project financing package to pay for phase-two construction. "The offer remains on the table and we believe it is beneficial to all stakeholders," Tygesen said. Turquoise Hill on Mar. 24 reported $1.6 billion in revenue for 2014 from the sale of 733,700 tonnes of concentrate. It also recorded its first annual positive operative cash flow of $658.3 million. 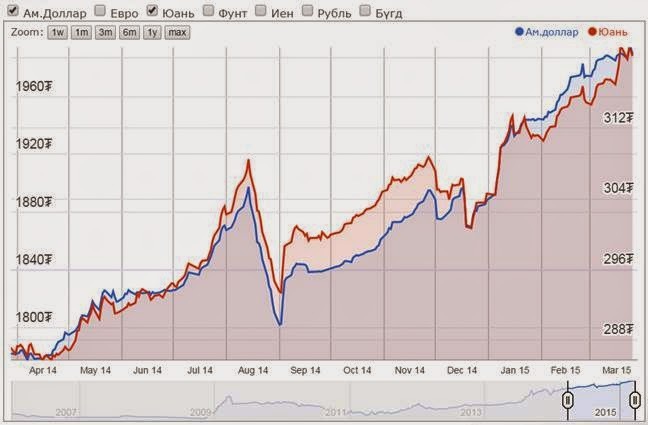 March 26 (Bloomberg) -- High costs and low coal prices mean Mongolian Mining Corp. could run out of cash by the end of the year, according to Moody's Investors Service. The Ulaanbaatar-based producer of coking coal may spend the $253 million of cash it had at the end of last year by Dec. 31, the ratings company said in an e-mailed statement Wednesday. Revenue and sales volumes are falling as the average price of hard coking coal declines. The forecast comes after the company replenished cash with a HK$1.56 billion ($201 million) rights issue in December. Coking coal, which is used in steel production, has fallen 2.3 percent this year, according to Energy Publishing prices. It's extending a four-year slump as China, Mongolia's neighbor and the region's biggest economy, grows at the slowest pace since 1990. Mongolian Mining reported a loss of $282.8 million for 2014 this week, including an impairment of $190 million on mining rights, as margins shrunk and transport costs to customers in China increased. "Mongolian Mining could deplete cash-on-hand by end-2015 due to a higher rate of cash burn," Moody's analyst Dylan Yeo said. "The rights issue last year and divestments of most of its non-core assets also left it with limited alternative sources of liquidity." No one was immediately available to comment when the company was called today at its office in Ulaanbaatar. Its $600 million of 8.875 percent notes due 2017 have fallen about 2 cents to 69.8 cents on the dollar from a 14-month high on March 6, Bloomberg-compiled prices show. Mongolian Mining offset $45 million of debt with trade receivables that were due from Malaysian-owned conglomerate Kerry Group, and extended the maturity of another $66.6 million of obligations until March this year, JPMorgan Chase & Co. said in a report e-mailed March 24. One bright spot may be its joint venture to acquire the Tavan Tolgoi coalfield, JPMorgan said. Tavan Tolgoi, located 270 kilometers (168 miles) north of the Chinese border in the Gobi Desert, is one of several large scale mineral deposits that Mongolia expects will stimulate the economy. In December, a group comprising Mongolian Mining unit Energy Resources LLC, China Shenhua Energy Co. and Sumitomo Corp. won the permit to develop a portion of the deposits (Mogi: more like won the right to negotiate with GoM), beating a bid from U.S. mining company Peabody Energy Corp.
"Its joint venture to acquire the Tavan Tolgoi coalfield would likely dictate the direction of bond prices in the near term," Soo Chong Lim, a Hong Kong-based credit analyst at JPMorgan, wrote. "The joint venture would enhance the asset backing of Mongolian Mining and potentially also give it some leeway to solve its balance sheet issue." Although the group is in formal negotiations with the Mongolian government to obtain mining concession rights for the field, there's "little clarity on the timing, costs, ownership and other key terms," according to Moody's. TORONTO, ONTARIO--(Marketwired - March 26, 2015) - Khan Resources Inc. ("Khan" or the "Company") (CSE:KRI) announced on March 2, 2015 that an international arbitration tribunal had rendered an award to Khan as compensation for the Government of Mongolia's actions in relation to the cancellation of Khan's uranium licenses in 2009. 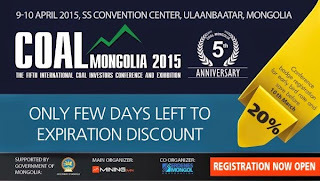 The award is now due from the Government of Mongolia and Monatom LLC. The award consisted of a Base Amount of US$80 million plus interest at LIBOR +2% (compounded annually) from July 1, 2009 to the time of payment. In addition, the Tribunal awarded costs of US$9.1 million in favour of Khan. As of March 31, 2015, the award aggregates to US$103.8 million. Interest is currently accruing at a rate of 2.546% or US$6,485 per day. The Company has tabled the above amount with the Government of Mongolia and has asked for full and prompt payment. An initial meeting with representatives of the Government of Mongolia to discuss settlement issues has been completed. The meeting was productive and both parties agreed to try to reach an amicable settlement. Provisions have been made for the holding of subsequent meetings, with the next meeting scheduled to take place during the week of April 20, 2015. Mr. Grant Edey, President and CEO of Khan, commented "The Company is pleased with the goodwill demonstrated by the Government representatives during this first meeting. We look forward to progressing the matter further at our next meeting." Khan intends to continue its vigorous pursuit of obtaining value for shareholders. March 24 (Carlyle Group) Investment analysts at RBC Capital reduced their price target on shares of Centerra Gold (TSE:CG) from C$6.00 to C$5.50 in a note issued to investors on Tuesday. The firm currently has a "sector perform" rating on the stock. RBC Capital's price target points to a potential downside of 13.79% from the stock's previous close. A number of other firms have also recently commented on CG. Analysts at TD Securities lowered their price target on shares of Centerra Gold from C$6.00 to C$5.50 and set a "reduce" rating on the stock in a research note on Monday, February 23rd. Analysts at Scotiabank raised their price target on shares of Centerra Gold from C$8.00 to C$10.00 and gave the company an "outperform" rating in a research note on Friday, February 6th. Analysts at HSBC lowered their price target on shares of Centerra Gold from C$8.50 to C$8.30 and set an "overweight" rating on the stock in a research note on Tuesday, January 20th. Finally, analysts at BMO Capital Markets downgraded shares of Centerra Gold from an "outperform" rating to a "market perform" rating and lowered their price target for the stock from C$7.50 to C$7.00 in a research note on Monday, January 19th. One analyst has rated the stock with a sell rating, three have issued a hold rating and two have issued a buy rating to the company's stock. Centerra Gold currently has an average rating of "Hold" and an average target price of C$7.22. Shares of Centerra Gold (TSE:CG) traded up 3.45% on Tuesday, hitting $6.60. The stock had a trading volume of 520,252 shares. Centerra Gold has a 52-week low of $3.16 and a 52-week high of $7.83. The stock's 50-day moving average is $6. and its 200-day moving average is $5.. The company has a market cap of $1.56 billion and a price-to-earnings ratio of 19.41. Ulaanbaatar, March 26 (MONTSAME) At the Stock Exchange trades on Thursday, a total of 14 thousand and 401 units of 15 JSCs were traded costing MNT 14 million 299 thousand and 447.00. "E-trans logistics" /7,869 units/, "Mongol makh expo" /2,814 units/, "Agrotechimpex" /1,800 units/, "Remikon" /1,034 units/ and "Bishrelt industrial" /288 units/ were the most actively traded in terms of trading volume, in terms of trading value were "Agrotechimpex" (MNTfour million and 860 thousand),"Mongol makh expo" (MNT four million 361 thousand and 801), "Material impex" (MNT one million and 550 thousand), "Gobi" (MNT one million 039 thousand and 090) and "E-trans logistics" (MNT747 thousand and 555). 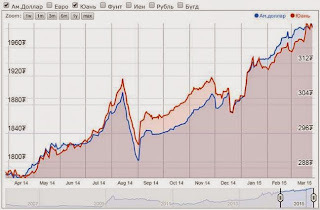 The total market capitalization was set at MNT one trillion 326 billion 311 million 886 thousand and 709. The Index of Top-20 JSCs was 13,129.86, decreasing 0.04% and the all index of MSE was 959.16, decreasing 0.01% against the previous day. March 26 (Bank of Mongolia) On the Foreign Exchange Auction held on March 26th, 2015 the BOM has received bid offers of USD 0.2 million in a rate between MNT 1990.0 and selling bid offer of USD 3.5 million MNT 1990.0-1995.0 and from local commercial banks. BOM has not accepted the offer. On March 26th, 2015, The BOM has received MNT Swap agreement bid offer in equivalent to USD 7.3 from local commercial banks and accepted the offer. March 26 (Bloomberg) -- Mongolia's 10b tugrik ($5m) five-year government bond sale Wednesday failed to attract any competitive or non-competitive bids, according to a central bank statement. * "The absence of bids for the government bonds is a worrying sign as it could point to liquidity issues for Mongolian banks," Bilguun Ankhbayar, CEO of Mongolian Investment Banking Group in Ulaanbaatar, says by e-mail Thursday. "It further shows that capital scarcity is becoming more problematic." Mongolia: Asian Tiger or False Hope? NEW YORK--(BUSINESS WIRE)--The New York Society of Security Analysts (NYSSA) will track the rapid but rocky transformation of Mongolia from agrarian society to would-be industrialized nation on Thursday, April 9. 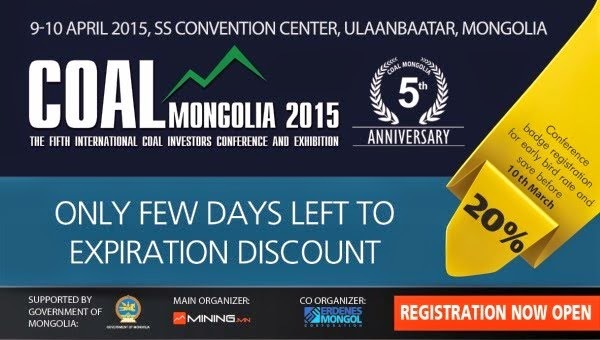 The daylong Investing in Mongolia Conference will highlight the recent rise of the Asian country as a global hotspot for minerals, precious metals and coal and ask if its booming mining sector can birth a true market economy. In addition, officials from the Mongolian Embassy and Mongolian Stock Exchange will on be hand to provide macroeconomic perspectives. The conference will take place from 8:30 a.m. to 5:30 p.m. Register to attend via the NYSSA website and follow #NYSSAMongolia on Twitter.